Keebler Elves in my studio? 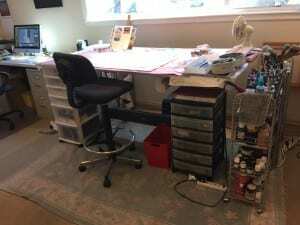 February 17, 2016 I find that many people are very curious about my studio – what does it look like? How do I work? Are there Keebler elves there? 7 Dwarves? 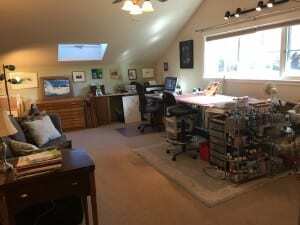 Since pictures are worth a thousand words, here is a photo walk-through of how my studio is arranged, and how I use it’s contents. Below: It would make a terrific guest bedroom but I have appropriated it for artistic use. It is the only room (besides a bathroom) on the second floor of our house. 24′ x 13′ All mine. 🙂 The large windows face east (a bit bright in the early morning so I pull the blinds for those few hours). There is also a skylight on the north side/sloped ceiling that makes my room very light filled. The skylight also opens so I can have additional ventilation. There was existing carpeting, nice quality but not very pretty, no problem. 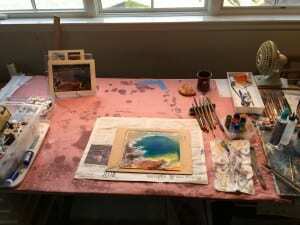 I place an area rug under my painting table to protect the carpet from errant wet paint brushes, but it is an art studio and eventually the carpet will get trashed. Or enhanced. It depends on how you view paint splotches. 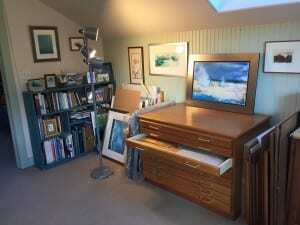 Below: The other end of the room has a wall of shelves holding many art supplies. I label most of them in see through plastic containers, so I can pull items out quickly and easily. Truly, organization is KEY. There is a sofa for afternoon contemplation, and it pulls out into a queen bed so if guests are willing (or we need the space) they can sleep in my studio. All I ask is that they create a painting before leaving. 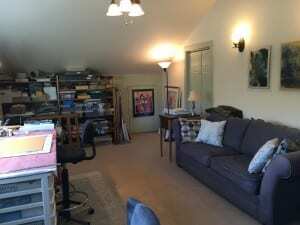 🙂 You can see two doors at the far end, one is a small door into an attic space which holds lots of boxes and shipping materials (too ugly to have visible) and the other is a large closet with more art supplies on shelves from floor to ceiling. Below: more bookshelves filled with art books. The walls have many small works by friend/artists and a shelf where I lean works in progress while I contemplate their fate. Invaluable is my “flat file” which stores papers, matting, works in progress, and shikishi boards. Now for my last “reveal”: I do keep track of appointments and work projects on my computer iCalendar, but have found this low tech project board MUCH more useful. 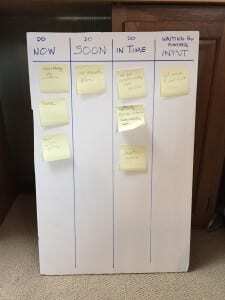 Post-it notes with each task are posted in the appropriate column (Do Now, Do Soon, Do In Time, and Waiting for Further Input) and moved or discarded as appropriate. It is right in my face, I don’t have to turn anything on, or get my glasses to squint at tiny screens. I don’t have to type or rearrange electronically. Simple.